Rosacea is a skin condition that typically affects the face, but can occasionally also appear on the chest, scalp, ears, or neck. It's a chronic condition, and depending on the severity, it can be life-disrupting. Rosacea tends to flare and go into remission, rather than being a constant condition. It can affect anyone, but it seems to typically affect people who are fair-skinned and tend to blush or flush easily. Women are diagnosed more often, but men usually have the more severe symptoms. The exact cause of rosacea remains unknown. One theory is that the blood vessels of the face dilate too easily, and that increased blood flow near the skin's surface makes it appear red and flushed. Other theories include sun damage beneath the skin, microscopic skin mites, skin bacteria, or irritation of follicles. An abnormal immune or inflammatory response may also be at play. Step-by-step instructions and essential oil recipes for getting rid of acne with all-natural ingredients. Research has identified two genetic variants that may be linked to rosacea, in areas associated with autoimmune diseases. However, this has not yet been formally demonstrated. There are several different symptoms. The most obvious is a redness of the cheeks, nose, forehead and chin that can come and go. This redness can become ruddier over time. If it's not treated, a persistent rash and pimples may develop. The skin on the nose may thicken and become swollen and bumpy. The eyes can also be affected, causing them to become irritated, bloodshot or watery. Small blood vessels may become visible on the skin. There may also be a burning, stinging, or itching sensation on the face. Rough, dry, plaques may appear in the form of raised patches. There may also be swelling and redness in specific areas of the face. Some patients go on to develop the late phase of rosacea, which is characterized by gross tissue hyperplasia of the cheeks and nose (rhinophyma) caused by tissue inflammation, collagen deposition and hyperplasia of the sebaceous glands. Ocular rosacea can precede or accompany facial rosacea and manifests as a combination of blepharoconjunctivitis, iritis, scleritis and keratitis, and causes pruritus, foreign body sensation, erythema and eye edema. The goal of treatment is to control the symptoms, not to cure the disease. Avoiding the triggering factors helps and these may be unique to each individual patient. Some patients find that regular facial massage reduces lymphedema. Antibacterial washes, topical creams, and antibiotic pills are treatments that are typically done at home, daily. Depending on your doctor's instructions, you may perform these treatments twice a day. Laser treatment, pulsed-light therapies, and photodynamic therapy are all done under the supervision of trained professionals, in an office setting. They are usually not done daily, but do require multiple treatments spaced apart. Isotretinoin is a prescription pill often used to treat acne, but can work for rosacea as well. Over-the-counter topical gels or creams designed specifically for rosacea can help with the bumps and pimples, and subdue the redness to a degree. 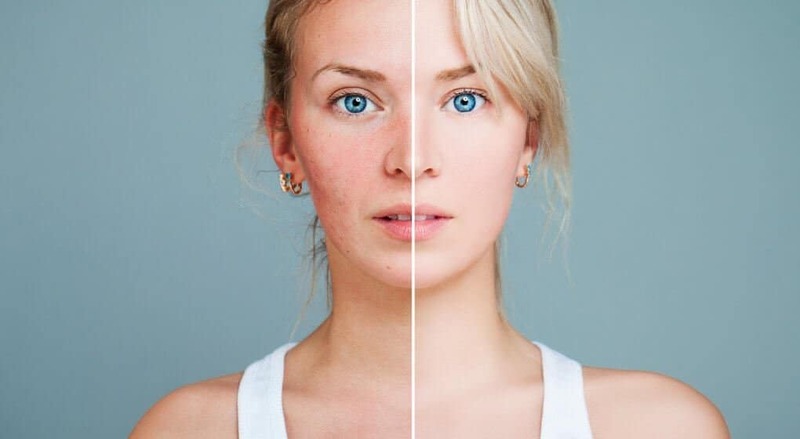 In mild cases, rosacea may not require medical treatment. Depending on the severity of your symptoms, you may see improvement just by sticking to some of the basic skincare tips listed below. Look for gentle, pure cleansers for your skin. Sulfa-based and benzoyl peroxide-based washes will help, but you want to look for products with natural ingredients. Green tea or diluted vinegar soaks may help reduce redness and inflammation. Look for products designed for sensitive skin. Avoid fragrances, alcohol, and other irritating ingredients. Don't rub your face when washing, drying, or applying skincare products. If you use topical medication, apply it before you apply moisturizers. Use sunscreen with an SPF of 50 or higher when going out into the sun. Use honey to moisturize: Massage honey onto face, let it sit for about 20 minutes, then rinse off. Most importantly, know your triggers, and learn to avoid them. There is no known cure for rosacea – prevention remains the best approach. In some cases, rosacea flare-ups can be managed without resorting to harsh, in-office treatments. These are some of the most common and effective at-home remedies. Coconut oil has been used to treat various skin conditions for centuries. It’s rich in Vitamin E, and doesn't dry out your skin like many cleansers and chemical treatments. Vitamin E blocks free radicals from affecting your skin and reduces signs of aging as well as rosacea symptoms. Apply a thin layer of virgin coconut oil once a day after washing your face. Apple cider vinegar makes for a great antiseptic skin cleanser, killing bacteria that can cause inflammation, but it should be used with caution. While a toner made from one-part water and one-part vinegar can be effective in reducing rosacea symptoms, it has also been known to make symptoms worse in very rare occasions. It also increases your sensitivity to sunlight, so make sure you apply sunscreen to your face before going outside. There are several essential oils that have proven effective in managing rosacea flare-ups. Some of these include chamomile, rose, lavender, thyme, and tea tree oil. All of these are soothing to the skin, and many contain anti-inflammatory and anti-bacterial properties that reduce rosacea symptoms. They should be used with caution, as many are too strong to be applied to the skin without being diluted with water first. In addition to being a healthy and tasty breakfast food, oatmeal can be used to make a paste that nourishes and calms your skin during a rosacea flare-up. Take 1/2 cup of ground oats, mix with 1/4 cup of water, and apply the resulting paste to your skin for 20 to 60 minutes. Peel it off, and rinse your face with cold water without scrubbing. Aloe Vera gel has many of the properties of a steroid cream without the side effects, making it effective in reducing inflammation. Its soothing, cooling effect also makes for a good pain reliever. Aloe Vera gel can easily be purchased over the counter. For best results, apply the gel twice a day after washing your face with a mild cleanser.